The annual “CPT” focuses entirely on vintage-style hot jazz. 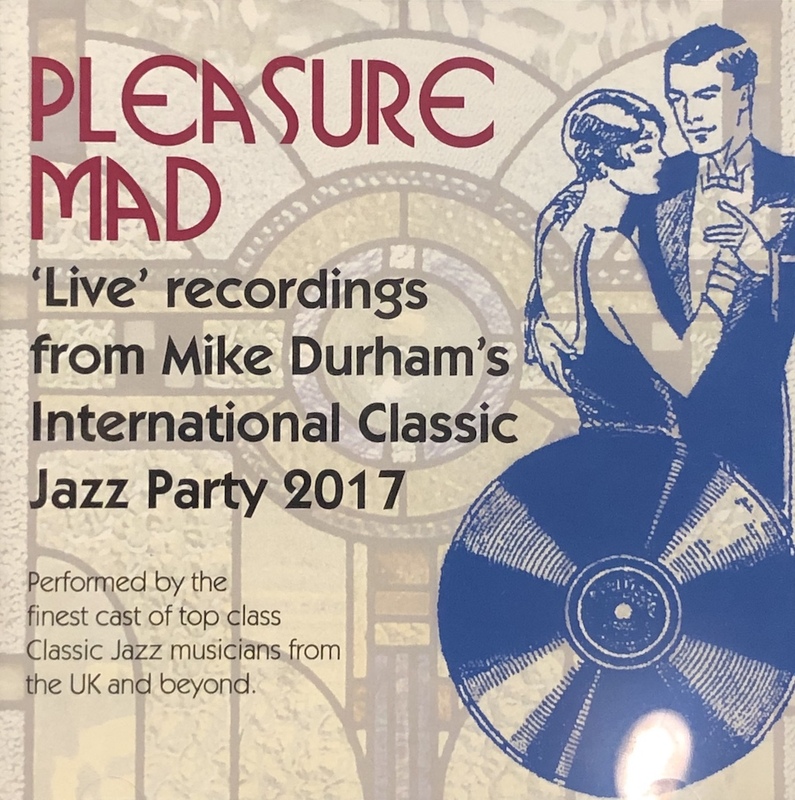 It has evolved from the long-running Whitley Bay Jazz Festival, directed by the late Mike Durham (himself an active band leader). Eventually, due to escalating costs, and administrative problems, the need to re-organise and to streamline became evident. With the efficient, knowledgeable and dedicated Mike at the helm, new plans were made to book a collective pool of like-minded, skilled stylists, who would mix and match in varying combinations to cover a range of vintage jazz styles. Such specialist musicians, world-wide, have duly convened over the years. Stock arrangements, transcriptions and new arrangements have ensured necessary structure and substance, rather than unrehearsed jam sessions. But this must have necessitated a considerable amount of in situ rehearsal and sound checks, in addition to the live performances. All the musicians must clearly have worked hard. Yet, the all-round enthusiasm and enjoyment is obvious. The tracks selected here were recorded live in a single venue with great care, Paul Adams of Lake Records as executive producer. Each mini-set nods to a classic theme, style, group or musician. The standard is consistently high, and it must have been a joy to hear in live performance such vibrant and spirited music. All the performances are well planned and played, but I particularly enjoyed on CD1 the Ellington 1927 tracks, the lively playing and singing of Spats Langham in “New Orleans Shuffle”, and a fine close recreation of Luis Russell’s “Saratoga Shout”. On CD2, the unexpected and ingeniously arranged intro to “West End Blues” is customised (somehow!) into intro and coda for “The Charleston”. The rapport between Mazurié and Seuffert is impressive. The Bernie Moten and Meat Packin’ Mann tracks, and a lovely “Skylark” are other stand-out tracks. Much dedicated preparation and understanding went into these well-performed and credibly authentic live performances. Mike, a lifelong devotee to the genre, would have been delighted. (1) The Georgians; (2) King Oliver’s Creole Jazzband; (3) Bleach’s Boys; (4) The Ellington Orchestra 1927; (5) Martin Litton (p); (6) Fletcher Henderson 1923-24; (7) Spats Langham (pianoless small group); (8) The Luis Russell Orchestra; (9) Young Benny Goodman; (10) Willie “The Lion” Smith And His Cubs; (11) Chanteuse Nicolle; (12) Trombonium; (13) Fat Babies; (14) The Alternative Hot Five; (15) Jabbo Smith; (16) Hot Dance Music; (17) 100 Years – Original Dixieland Jazzband; (18) Bennie Moten – Get Goin’; (19) Morten Gunnar Larsen (p); (20) Meat Packin’ Mama; (21) Jacob Gershowitz Got Rhythm; (22) Duke Heitger’s Jazz; (23) The Nichols-Duffee All-Star Orchestra. Collective personnel: Mike Davis (t, v); Andy Schumm, Duke Heitger, Jamie Brownfield, Malo Mazurie (t, c); Kristopher Kompen, Graham Hughes, Jim Fryer (tb); Michael McQuaid, Richard Exall, Matthias Seuffert, Claus Jacobi, Ewan Bleach, Lars Frank, Jean-Francoise Bonnet (cl, ss, as, ts, bar, bar); David Boeddinghaus, Martin Litton, Morten Gunner Larsen (p); Keith Nichols (p, v); Spats Langham (bj, g, v); Martin Wheatley, Peter Bayener, Jacob Ullberger (bj, g); Malcom Sked, Henry Lemaire, Phil Rutherford, Richard Pite, Elise Sut (b, bb); Josh Duffee, Nick Ball, Richard Pite, Nick Ward (d); Emma Fisk (vn); Nicolle Rochelle, Joan Viskant (v). The Village Hotel, Newcastle-Upon-Tyne, 27-29 October 2017. "The standard is consistently high, and it must have been a joy to hear in live performance such vibrant and spirited music".